I was getting a hair cut a few days ago, and the barber lady asked me if I was married. For the good-looking people of the world, they are probably used to hearing this question and recognize it as a start of a courting conversation. As for someone like me, it’s usually only asked of me when I am purchasing insurance, so I was taken a bit off guard as she didn’t look like she sold insurance on the side. I answered that I was, and she asked if I had Valentine’s Day plans. Oooohhhhhh, this is where the conversation was going… I told her that my wife and I usually don’t do anything on Valentine’s day because it’s usually crowded and expensive. We have a tradition of making a gift for each other. “Oh! What did you make her?” she asked. I supposed if I really thought through it, I might have chosen a cuter subject to scan and print… like one of my sons… or our borrowed dog. But, I suppose with it being Valentine’s Day and all, perhaps my wife’s husband is the most appropriate subject after all. It won’t be pretty to look at,but the consolation is that the purpose of these statues is to be eaten, not really to be visually admired. 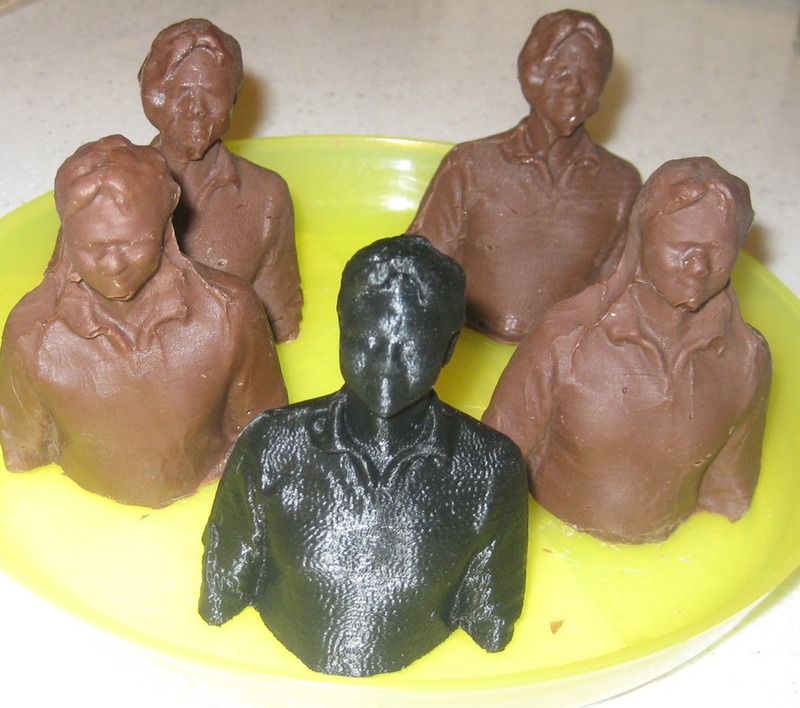 I also found that there were other strange questions you have to grapple with when you’re making a chocolate statue of yourself. Dark Chocolate, Milk Chocolate, or White Chocolate? My wife’s favorite is white chocolate… but it just seemed a little weird to make myself white… A clash of self-identity issues and taste preferences. I have to admit that it was a little strange seeing her take a bite into my head. But, I got over it and took a bite of my arm. I did offer one of the chocolate me’s to my mom… but she refused to eat it citing that it was gross… That’s probably the typical and reasonable response I would expect from most women when they are offered a piece of chocolate in my likeness. But, that’s what makes Tenille so special. She’ll bite off my head without a second thought. What a lady! From Tenille, I received a much more practical gift of a mix CD. I got to listen to it on my commute. It contained all the special songs that we’ve shared throughout our marriage. Thank you, Tenille! Happy Valentine’s Day to my sweet wife. Sounds like a great project!! He can ping me if he wants to talk shop.